The Seattle metro area is home to some of the largest American corporations, such as Boeing and Microsoft. (Although Boeing moved its headquarters to Chicago, it's still one of the largest employers in the area.) But that doesn't mean that the cost of living and housing is proportionate to the job and income growth in the area. The Economic Development Council of Seattle and King County argues that there's a reason for the high housing costs--mainly because roughly 25% of local residents are in either professional or managerial positions. To be fair, few people move to the Bergen-Passaic area in hopes of finding a job in town. The area is full of professionals who commute to and from New York. Still, local residents are almost paying big city prices to live outside the big city. In terms of job growth, the area ranked 110 out of 150, and income growth was 102 out of 150 places ranked. Florida may have led the nation in adding new jobs last year, but Miami-Dade County's unemployment is still higher than the national average (above 7%). In a Miami Herald report, Governor Jeb Bush said Miami's lagging unemployment rate was due to the fact that Miami was "unique" because of its high costs. He got that right. 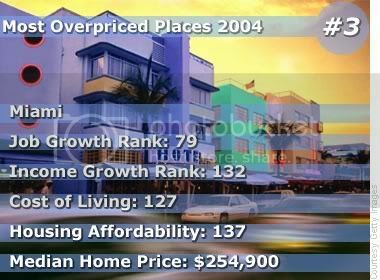 The city ranked 137 out of 150 places for housing affordability and 127 out of 150 for cost of living. Living in the sand and sun isn't cheap, apparently. "We need to improve the business climate of the Portland area, because we are racked with some of the highest unemployment rates and the lowest job-creation rates in the country. Those are unacceptable." Those were the words of Jonathan Schlueter in an Oregonian interview after he was named the executive director of the non-profit Westside Economic Alliance in Portland. During the tech boom, Oregon became a desirable destination for professionals hoping to find an affordable alternative to the Bay Area, but it ended up driving up the cost of living, and the job market hasn't quite caught up. Some of the largest employers in Middlesex include large companies such as Bristol-Myers Squibb and Merrill Lynch, and the area's unemployment rate has been below the national average (last year it was 5.4% while the national unemployment rate was 6%), but it's not clear how many people are employed locally since Middlesex County, roughly 40 miles away from New York City, is also a major bedroom community for New York professionals. 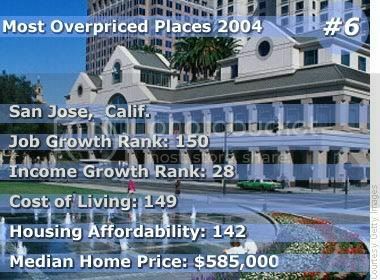 San Jose, the largest city in the Bay Area, wasn't really considered a desirable place to live prior to the tech boom. During the late 1990s, however, as housing prices rocketed along with the stock market, it became just as expensive as its northern neighbor, San Francisco. Now the city is left with a 6.8% unemployment rate hangover, and housing costs are still among the highest in the country. While the Chicago economy is showing modest improvements--the unemployment rate declined by 0.9% according to the most recent statistics released by the Illinois Department of Employment Security--its job growth ranking leaves much room for improvement, and its 6.2% unemployment rate is still above the national average (currently at 5.5%). Still, the $228,100 median home price is significantly less expensive than places like San Francisco, where the median is above $500,000. New York expensive? Fuggedaboudit! As of June 2004, the unemployment rate in New York City was a steep 7.4%, according to the Bureau of Labor Statistics. 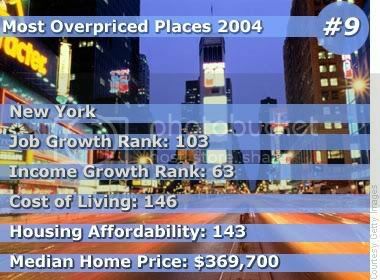 Meanwhile, New York still remains one of the most expensive cities in terms of the cost of living and housing affordability. But as they say, if you can make it there, you'll make it anywhere. 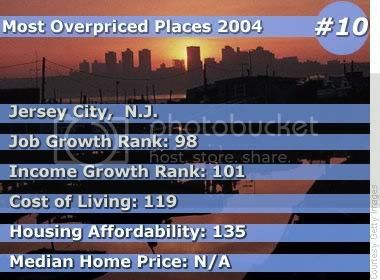 Although Jersey City is showing some economic promise, the cost of living is still high in relation to the local job growth. The city is trying to sell itself as its own economic hub, and even managed to persuade Wall Street financial firm Goldman Sachs to move into a new office tower on the waterfront, which is estimated to have added 1,100 jobs to Jersey City's local economy. Still, the city has a bit more growing to do before its job market catches up to the local cost of living. I'm surprised at some of the listings. I would've expected San Diego to be in the top five, and it's not even in the top ten. 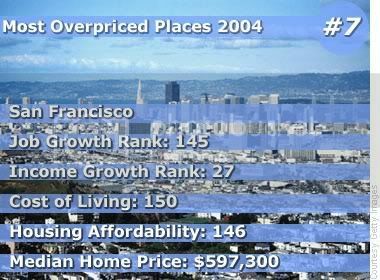 I also would've expected San Francisco to rank higher than it did. 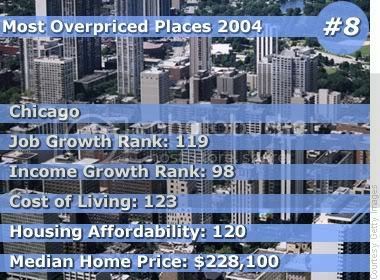 Also, I've always thought of Chicago as one of the most affordable large cities to live in. I don't think prices there are out of line at all. The housing is even somewhat affordable, considering that it is an urban environment. I guess the fact that Boston doesn't rank is a good sign for it's job market. Boston is the second or third most expensive city, depending on how you count, at least it's not considered that overpriced. Though I'm sure it's just off this list. How did I forget about Boston?! I would expect it to be higher up on the list. San Jose and San Francisco's average housing comes to be around $591,150 based on the whole Bay Area. The main reason why it isn't cheap is because of a narrow piece of flatland and the terrain. That means construction workers and architects have to deal with building roads and homes on hills. Marin County is too mountainous to build. If there is any available land, it gets swallowed up quickly with development. Add on the costs of building where you get the views of the bay and the hills. I was suprised that New Yorks wasn't higher. I mean, when I think New York, I think about the exorbitant apartment/condo prices just to see Central Park, and the Upper East Side and generally high costs of living. I guess the rest of the city brings the average down alot though. Notice how all but Chicago are located on the coasts. But all are located near water. Some would say that the Great Lakes consitutes a "coastal area." That's because most of the country lives on one of the two coasts. Once you get away from the coasts you're pretty much outside of all the really large metro areas, with the exception of cities like Chicago, Denver, & Detroit. Yeah I know I missed some...I was just using those three as an example. Today is Monday, and my brain doesn't function fully on Monday. If I were to list every one it would've taken me half the night, which I cannot afford, seeing as how I have 26 drawings due one week from today. Most of the population lives within 250miles of a major water body (oceans, gulfs, great lakes. Denver and Kansas City are the only large-scale cities that dont meet that qualification. Dallas has got to be close to meeting that criteria. I think it does. If not, its really close. - $1,600 for a closet-size studio is too much...and I couldn't live with 4 roommates! - Rents have come down a bit after the big dot.com bust; fortunately, I am in a rent controlled flat for now. 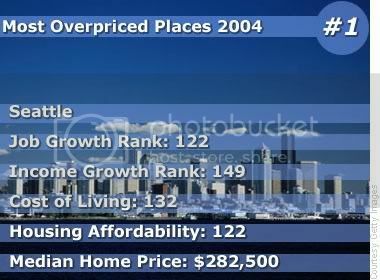 Also, I've always thought of Chicago as one of the most affordable large cities to live in. I don't think prices there are out of line at all. The housing is even somewhat affordable, considering that it is an urban environment. 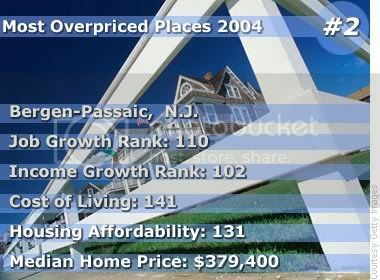 It used to be, and is still a bargain compared to the coasts. 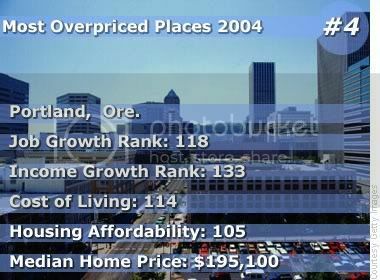 It has gotten very expensive for an inland city though. I bought a small, 30 yr. old condo 2 years ago with no in unit laundry, no garage for $91,000. It's now worth at least $110,000. I am just absolutely stunned. I was thinking I would be lucky if it was worth a price in the mid $90's by now. New condos in town, near the train station, start at nearly $300,000, and that's a real bargain compared to other inner ring suburbs. There have been a ton of tear downs to build new homes over the past few years, with a starting price well over $400,000. Again, it's a bargain becasue we're in the south suburbs. Very nice area, but a very long commute to the major suburban employment centers. I don't have much hope of affording a nicer home without moving to a cornfield 40 miles from the city, which will mean an even worse commute. In the city, studio units generally start near $300,00 and with a few exceptions a two bedroom condo will probably begin near $500,000. Obviously the greater the demand the higher the price. However, the more geographically constrained an area the more expensive - which is why coastal cities as well as Chicago (Lake Michigan) are more expensive. With all the real-estate speculating going on you definitely see some out of whack pricing. Minneapolis, for example, seems to be approaching Chicago prices which is odd considering we have no geographic constraints to growth. Indeed. Even an average small condo in downtown Charlotte is $375 sq/ft now in some buildings. That is just insane. Yup --Downtown Minneapolis is at about $400 sq/foot too. My neighbors just put their place for sale Downtown for $590,000 --It cost $260,000 just 2 years ago when it was new. Crazy! yeah, i was shocked that boston isn't on this list. What is going on in Chicago? It is a huge global city with an extensive public transit system and it is comparatively affordable. Why? They need to share their secret with LA, NY, SF and BOS. Also: I would have posted this on a the Chicago forum if I could find it. My fiance and I lived in Portland for 6 months. That was all it took to break our bank account. There are no jobs unless you work in health care. There were over 250 applicants for one of the part-time jobs I applied for. There is a big lack of industry because of the location. I also lived in Chicago for many years, but moved when my the building I lived in was sold and they raised my rent an extra $240 a month. 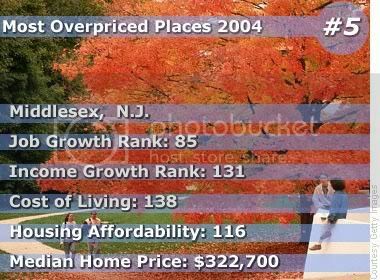 It was so affordable when I moved there in 1996, but when I left in 2001 it had changed greatly. The rents and selling prices of homes have still continued to rise.